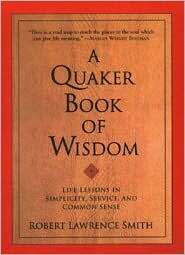 Robert Lawrence Smith’s A Quaker Book of Wisdom is a perspective of Quaker spirituality and philosophy. Smith descended from a long line of Quakers that go back to founder George Fox. A former headmaster of a Quaker school for children, Smith explored Quaker belief in ten areas: silence, worship, truth, simplicity, conscience, nonviolence, service, business, education, and family. Rather than break each of these areas down, I would rather skip to the end of Smith’s book and look at the Ten Life Lessons he offered for a Quaker legacy. I believe these are relevant for all faiths and lifestyles as ways to become more fully alive. My comments follow Smith’s lessons. Embrace the present moment and stop despairing about the past and worrying about the future. 2. Love yourself, whatever faults you have, and love the world, however bad it is. It is much easier and helpful to love others when you love who you are. 3. Stop talking and listen to what you really know. Silence drowns out the rhetoric (both of others and of you) and gives you a chance to learn who you are (and are not) and what you know (and what you do not know). Let go sometimes and have some fun with others by playing some kind of game that involves teamwork and competition. 5. Accept the fact that our lives are only partly in our own hands. Although we have some control of what happens, we need to realize that we do not control our lives completely. 6. Believe in the perfectibility of yourself and society. We all can make changes to make ourselves better. 7. Make your love visible in the world through your work. When others see how much you love your vocation, people become excited and encouraged to do the same. 8. Seek justice in the world, but not in your own life. Rather than lament about how unfair your own life is, take that energy and seek justice for those in the world that need help. 9. Look for the light of God in every person. If you realize that the divine rests in all people and in all of creation, it is much easier to be helpful and loving, rather than hurtful and hating. 10. Let your life speak. Be the person you want to be and live your life on your own terms, which will be a shining example for others that need a little help. Live simply, conscientiously, and quietly. Do not hurt other people and embrace education in all forms. I think this can work for all people, not just Quakers.